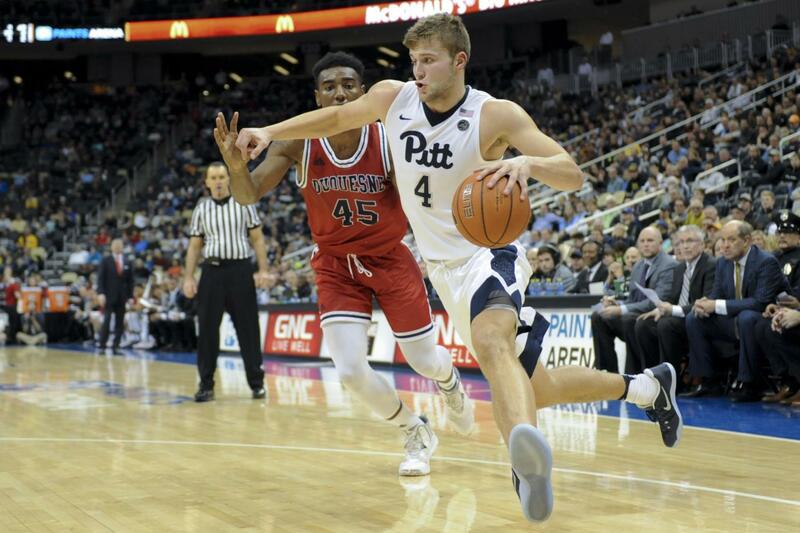 As Ryan Luther watched all but two members of the Pitt basketball team depart this off-season, his dedication to the Panthers never wavered. Before a tumultuous season last year under first-year head coach Kevin Stallings, the Panthers knew they would need to replace four graduating seniors at the end of the year. But then the dismissal of first-year Justice Kithcart foreshadowed an off-season of unexpected departures and a decommitment before the team even reached its final regular season game. These changes left the program in a tough position with a new coaching staff and only three remaining players. The team was in for a big transition, but Luther dealt with it in stride. Raised just 20 miles north of the City, in Wexford, Luther grew up a Panther basketball fan and a member of an impressive basketball family. His two older siblings, Jodie and Bill, his twin brother Collin and Luther himself each scored more than 1,000 points in the Western Pennsylvania Athletic League. Luther wasn’t even the first of his siblings to play at Pitt — Bill played at Pitt Johnstown from 2010-2013. Lettering each season of high school, Luther gradually grew into his 6-foot-9-inch frame and increased his production. By the end of his junior season, he had broken the all-time scoring record at Hampton High School, averaging 21.3 points and 7.7 rebounds per game that season — and colleges took notice. Luther received offers from Duquesne University, the University of Dayton and George Washington University, and headed into his senior season set to choose between these three schools. But, just weeks before making his decision, a fourth school entered the fight: Pitt. Once former head coach Jamie Dixon made an offer, Luther had his answer. Luther didn’t become complacent after locking down his commitment to Pitt. Instead, he dominated Pennsylvania high school basketball, averaging 22.3 points and 7.7 rebounds per game en route to winning the 4A Pennsylvania State Player of the Year award. Though he was continuing his basketball career just 30 minutes away from Hampton High School, a lot changed when Luther came to Oakland and joined the Panthers in 2014. Academically, the transition to college was not difficult for Luther. He had a GPA greater than 3.5 in high school, which helped his transition to the business school as a marketing major. In his career, he has already been named to the All-ACC Academic Team twice. On the court, however, Luther had a much steeper learning curve. Luther appeared in 23 games that first year, but mostly played a complementary role, averaging fewer than eight minutes per game. In his sophomore season, he appeared in all but one game and increased his scoring output from 1.9 to 5.0 points per game, but still wasn’t a primary contributor. When Dixon left the Panthers to join TCU in 2016, Stallings and his staff immediately connected with Luther. Set to play a “sixth man” role on an experienced team, Luther and the Panthers were poised for a big year. Luther was a big contributor to Pitt’s early 12-3 record, averaging more than 20 minutes on the floor while putting up slightly more than six points and four rebounds per game. In his best performance of the season, Luther dominated, scoring 20 points and grabbing seven rebounds in a Dec. 17 victory over Rice. Luther looked to be on his way to an impressive season, but fortunes for Luther and the Panthers quickly changed. During Luther’s absence the team went 3-9, and once he returned things didn’t improve. The Panthers went on to lose their final four games to conclude the season at 16-17, placing second to last in the ACC with a 4-14 conference record. “Even though I didn’t get to have the season I wanted to, both individually and as a team, that kind of put things in perspective for this year,” Luther said. After the sweeping roster changes at the end of last season, Luther quickly emerged as the new centerpiece of the Pitt basketball team. As the only remaining player to average more than 10 minutes per game last season, the Panthers needed him to take on more responsibility. Luther’s coaches said he made an effort to improve as a leader. Beyond his newfound leadership, Luther has improved his game over the past three years — specifically improving aspects such as his handle and shot. According to his coaches, he’s also constantly working to get better in order to shoulder more of the responsibility on the floor. With the Nov. 4 season opener against Slippery Rock quickly approaching, the national media predicts the Panthers will finish last in the ACC. But Luther wants to prove them wrong.